If the expression Coach Trip makes you think of the Seaside, Stout and Singsongs, you’re very out of date! Coach trips are now a luxurious way to travel, relaxing and hassle-free. I went on a coach trip to Somerset. 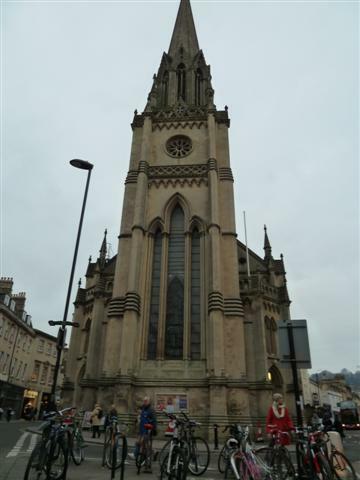 First stop was in Bath. We wandered around the town for a few hours, then we visited the Roman Baths. Yes, the Romans were magnificent builders and their work is still awe-inspiring, but I’ve seen a lot of Roman baths in different countries, and, although always impressed, I know what they usually look like. The public used to be allowed to bathe in the hot water until amoebas were found in it, due to pigeon droppings. Now we just walked around the edge. But I did have a drink of lukewarm Bath water from a tap, in a cup! 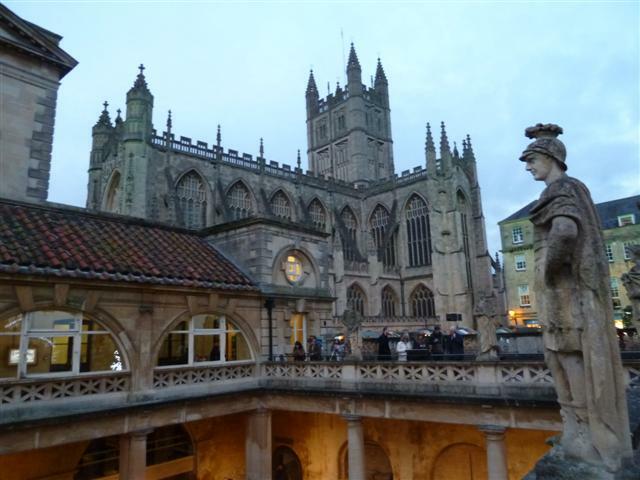 Bath’s Cathedral is almost next door to the Roman baths. 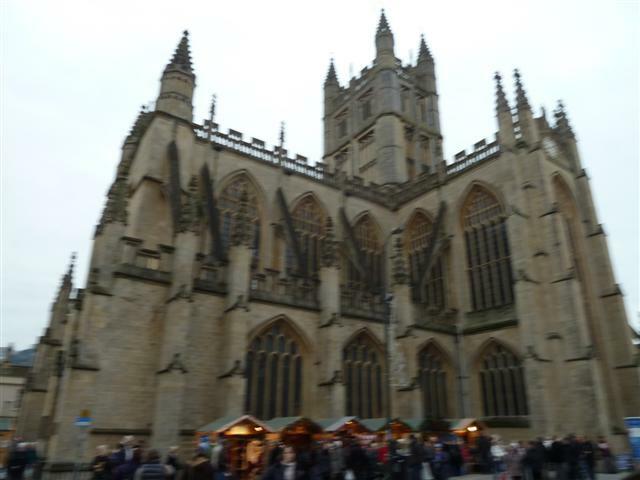 It’s a magnificent building and you can’t visit Bath without seeing it. The pedestrian shopping centre has a wide variety of shops, without any graffiti on them! The Bath residents are obviously proud of their town. One problem? The traffic. A few more roundabouts would work wonders, I’m sure. We spent the first night in the Hilton in Bath. The Hilton’s décor is looking a bit ‘shabby chic,’ but the food was really good, especially the breakfast! I hate tepid, dried up buffet food and I’m always worried about the temperature. But the Hilton actually had a hot, fresh breakfast buffet. After breakfast we caught the coach to Longleat. The Guide was waiting for us at the magnificent entrance and I managed to be the first in. Oh, it’s so MOI! I’m thinking of naming our house Shortleat! Note to self; stop dreaming, Lyn, and write that novel! We were shown round The Marquis of Bath’s private quarters. It’s like Bloomsbury with Wacky Baccy! 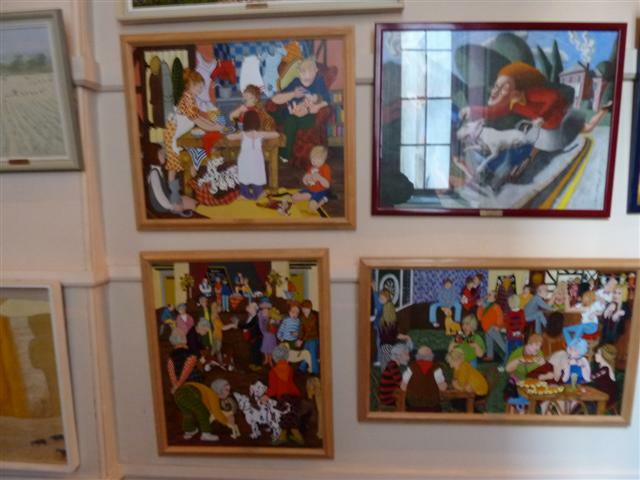 Every inch of it has been painted, often using a sort of clay to give it a raised surface. It might not be to everyone’s taste, but Lord Bath is definitely a talented artist. His staff love him, and he’s very approachable, although always addressed as Lord Bath. He’s quite deaf now, but he’s up for anything. It’s his advisers that rein him in. He was asked to do I’m a Celebrity, Get Me Out of Here! And he really wanted to do it. But he was told that, with his diabetes it wasn’t a good idea, so he turned it down. Are cockroaches, worms and testicles bad for diabetes? I’m sure they contain a lot of protein! There’s a large lake in the grounds and we had a trip around it, feeding all the sealions on the way. Then we saw some dear little marmosets that look like shrunken old men. After that we went in the Lorikeets’ cage where we were given pots of food. They’re colourful and completely fearless and perched all over us. It was really funny! Then I went to stroke one of them on the tum and the little b***** bit my finger! Longleat is a very well-run business. Prices are reasonable and there’s plenty to do and see for a whole day. We all loved it. Then it was onward to Clark’s Village. It was opened 20 years ago on the old site of Clark’s Shoe Factory and it’s still growing. The shops are mainly factory outlets, with Jeff Banks, Jaeger, Monsoon, Clarks of course, and many more. It’s right next door to the main shopping centre, so you can cross the road and find plenty more shops. I could have done with more time there – and more money to spend! We travelled on to Wells, the smallest city in England. We stayed in The Swan Hotel, directly opposite the Cathedral. The Swan is an old 4-star coaching hotel with lots of staircases. I kept bumping into guests who were going up and down, trying to find the way to their room. Wells Cathedral has been the site of many films – but they turned down Harry Potter! They didn’t think it was suitable. In the morning we went exploring. I wanted to see the Bishop’s House. It’s next to the Cathedral and it has a moat round it. The swans have been taught to ring the bell by pulling on a rope when they’re hungry, and the ducks have taught themselves! Sure enough, just as we got there, a swan delicately pulled the rope and rang the bell, then waited, looking patiently upwards. Apparently the resident cat has got so excited several times that it’s fallen out the window and had to be rescued from the moat! Back on the coach, we travelled along the Cheddar Gorge and stopped at Gough’s Cave, where Cheddar Man, Britain’s oldest skeleton was found. The Cheddar Gorge area is part of the Longleat estate. Okay, apology time; I lied about the seaside. Sorry. We went to Weston-Super-Mare to visit the newly-refurbished pier. They’ve spent £30 million on it since it was burnt down. But instead of rebuilding it as it originally was, they’ve brought it into the 21st Century. They’re licenced to carry out weddings and there’s a huge function room on the top floor, with private parking opposite the pier. It was being used for an 18th birthday when we went there, and as an extra surprise treat, his parents had hired the Go-cart track in the enormous games room. At the end of the pier is Tiffany’s Edwardian Tearoom. To my surprise, the quality was outstanding. We had well-filled sandwiches made with ‘real’ bread, fresh scones with clotted cream and jam, and gorgeous slices of home-made cake, all served on cake stands, with unlimited tea. And the lovely views were on all three sides, through huge windows. The public toilets, one of my pet hates, were also faultless. Back at the Bath Hilton, we all said our goodbyes and set off for home. It was a great weekend, travelling in comfort high up with good views and lots of legroom. John the chatty driver was a mine of information. He knew every inch of the area and would tell us snippets of history and details about the landscape that were very entertaining. And he would slow down or stop for photos. Most Coach Companies are family-owned and some have been in the family for almost 100 years. A lot of them will send a car to pick you up at home and take you back. I’m going on another trip in the near future, so watch this space…. I travelled as a guest of the Coach Tourism Council, which promotes coach tours on behalf of coach operators from across the UK, including many in the Southeast. Visit www.findacoachholiday.com for general information. Brighton & Hove Bus and Coach Company Ltd (01273 886217 www.buses.co.uk) operates in East Sussex. It has day trips to Longleat (22 April) for £36pp and to Bath on 13 June and 10 September for just £24pp. It also offers a 5 day/4 night tour taking in Glastonbury, Clarks Village and Wells Cathedral for £399 for DBB and staying in the Somerset countryside at Warner Leisure Hotels Cricket St Thomas, a Regency style elegant mansion set in 160 acres of landscaped gardens. It offers a number of on site leisure facilities (and is perhaps best known for its part in To the Manor Born). Woods Travel of Bognor (01243 868080 www.woodstravel.co.uk) has a 5day/4 night tour in August to Bath, Bristol and Somerset for £433 (no single supplement, taxi pick-up from home) staying at the Best Western Centurion Hotel in Midsomer Norton with tours through the Mendips and Cheddar Gorge and visits to the pretty town of Shaftesbury and the famous Gold Hill, Wells, Glastonbury, Bristol and Dyrham Park and a guided tour of Bath,. Epsom Coaches (01372 731705 www.epsomcoaches.com) with pick up points for its tours from Guildford, across to Bromley, Reigate, Gatwick, Redhill, Oxted etc, has two tours to Somerset in 2013 including in September a Bath and Somerset Connoisseur break staying in Midsummer Norton at the Best Western Centurion Hotel which includes 3 nights DBB (with a glass of wine at dinner) for £469pp. It includes visits to Bath, Dyrham Park (in south Gloucestershire), Wells Cathedral, Glastonbury and the Cheddar Gorge Cheese factory. Note the service on this tour includes collection from your home and the services of a tour guide throughout. Skinners of Oxted in association with Palmers Travel in North Kent (01883 713633 www.skinners.travel) has a 5 day/4 night DBB tour of Somerset in October (£472pp) staying at the Best Western Webbington Hotel & Spa in Axbridge and featuring visits to Bath, Wells Cathedral, Glastonbury, Clarks Village, Goughs Cave at Cheddar Gorge, Bath and on the return journey the National Trust village of Lacock and Bowood House.